Every other year since 2009, Disney has held a D23 Expo in Anaheim, offering planned entertainment and lots of surprises for fans. At the 2013 D23 Expo, among the biggest surprise moments for theme park junkies were unannounced appearances by Dreamfinder with Figment in hand. The beloved and long lost character from Epcot’s original Journey Into Imagination pavilion, Dreamfinder has been missed since being removed from the theme park quite a few years ago. But D23 – Disney’s official fan club – understands how much he is missed and seized the opportunity to offer a brief chance to meet him once more. On Saturday, August 10, 2013, Dreamfinder first walked out on stage with Figment in hand during the Disney Legends ceremony in honor of Tony Baxter, the man who led the creation of Journey Into Imagination along with Dreamfinder himself. On stage, Tony expressed his own affinity for the bearded character, asking “When are we bringing Dreamfinder back?” – met with big cheers. But the Figment fun didn’t stop there. D23 Expo attendees who happened to be wandering through the Walt Disney Parks & Resorts pavilion, aptly called Journey Into Imagineering, may have discovered a brief meet-and-greet with Dreamfinder, the first time such an encounter has been available to fans for many years. Meetings with Dreamfinder are among the top memories many fans have from visiting Epcot as a kid, so those lucky enough to witness this special opportunity received a big unexpected treat from D23. But the Journey Into Imagination fun didn’t stop there. That evening, as part of the Disney Songbook concert, Richard Sherman played and sang “One Little Spark” among his hour-long medley of fan favorites. This wasn’t the first time D23 welcomed Dreamfinder back to the world of Disney at a special event. During Destination: D Walt Disney World in 2011, Richard Sherman also performed a special evening of music that included a surprise “One Little Spark” singalong during which Dreamfinder also showed up. It’s clear from the fan reaction that Dreamfinder and Figment ought to always have a place in Epcot and CEO Bob Iger plainly stated that he agrees. “I don’t think Figment is going anywhere any time soon. I promise,” he reassured the crowd at the 2013 D23 Expo. Though meet-and-greets with Dreamfinder aren’t likely to extend beyond the walls of the Journey Into Imagineering pavilion this weekend, it’s comforting to know Disney most definitely hasn’t forgotten about him. How about a today version of the original Journey Into Imagination!!!??? I really hope the rumors are true about then overhauling the whole pavilion. The current state of the Imagination Pavilion has always been a thorn on Disney Parks side. I hope that this is a sign of things to come. Imagine if they brought back a today version of the original ride with a trackless system like Mystic Manor….. Ohhh heck yes now we are talking. Just the merchandise and the amount of people that would show up to Epcot would MORE than pay for the ride…. This and let’s get a new 3d show inside the Magic EYe Theater…. Just keep the track system that is already there. I’m sick of fanboys opting for the trackless ride system. My biggest problem with it is you can’t go uphill or downhill and the current track/setup is not flat. But the system they have now is not able to handle the strain of the original imagination. That’s why 40% of the track was cut out of the ride when they redid it. They need something that’s cutting edge and reliable. The trackless system can at least be programmed to do something like the flight of fantasy again without having to lock into the set piece like it use to. Also, it would not have to worry about catching up to other ride vehicles to latch on at the end to become a continuos ride system in the station like it use to. Yes the it would be awesome to have something that went uphill and downhill, but when they bring back Journey into Imagination, I want to make sure there is not a flaw anywhere and the ride system can be trustworthy so we can have something that’s good forever and doesn’t have to be replaced. That Dreamfinder does not appear to be Ron Schneider, who reprised his role at Destination D. Any idea who portrayed the character this time? That’s Steve Taylor, who portrayed Dreamfinder from 1982 to 1998, the longest run in the role of anybody. Thank you, Sir. And honor to have a response from the source. My compliments to both you and Mr. Taylor. Thanks you for all of your contributions to the joy of live entertainment. Thank you Geren and Ron, let me just say it was an privilege to be at D23 Expo to honor the TRUE Dreamfinder, the one and only Tony Baxter. If I may say there have been many men over the years bring the character to life. Each one brought some of there own personality into the role and I have had the opportunity to know each one. Two men in California had something to do with the part before anyone was seen in EPCOT Center in Florida. Then there was one in Florida for the groundbreaking of the land that has been our beloved home and his name is Joe Hudgins. Ron opened the park and is the first that many of the guest met in the beginning, he was our professor if you may. He was there only with Figment from the opening in October 1982 till January 1983 when I came along. Ron did an wonderful job in coaching me with how he envisioned the character to be portrayed. He had books and papers explaining the background of everything encompassing “Journey inti Imagination”. This was very helpful in more ways than he even imagines. 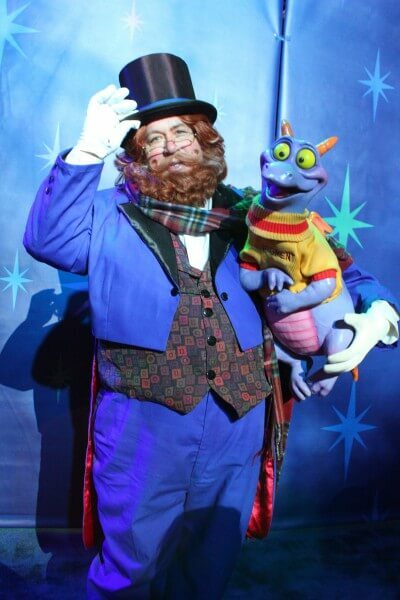 Ron got frustrated with the way I portrayed the character I know, but I had found that Dreamfinder had a somewhat different feeling to me and I became him when I was with Figment. After I came along it was a little while but we did have others that helped us come into your lives. This just goes on to show that the One and Only Dreamfinder is now and will always be, the newest “Disney Legend” Tony Baxter. a fully branded customizable attraction marketing system that brands you as a leader in the industry. of online internet marketing and home based business keywords are king.